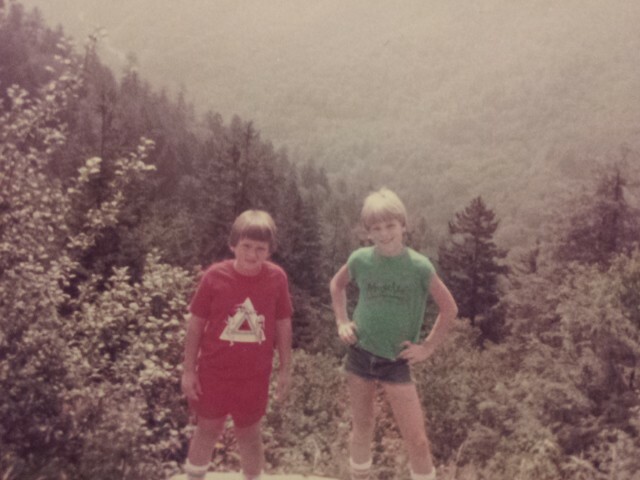 The Smokies were another childhood vacation destination. We would go to the beach and the mountains at least once a year. 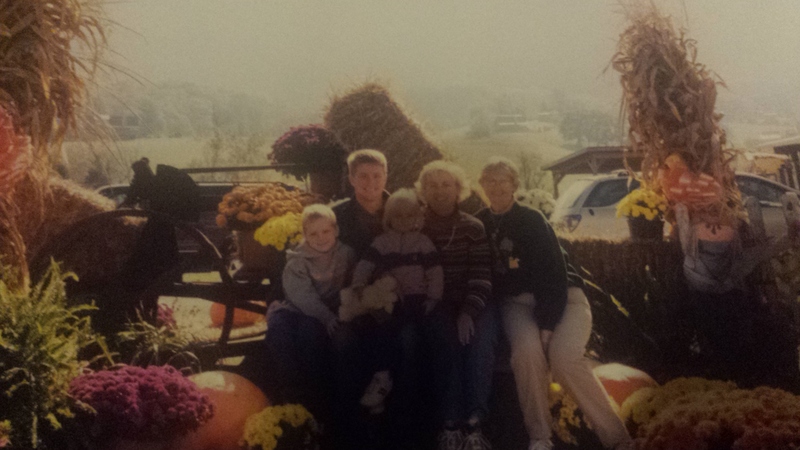 When I was younger we would see all the tourist attractions; like Dollywood, the Comity Barn, go carts and shows. While we still like those things, the beauty of the mountains is what I go to the Smokies for now. There is no better way to experience that beauty than to get out in it. That means a hike. There are hundreds of trails in the Smokies, from short nature walks to 38 miles on the AT. I have done a few but there is more to see. 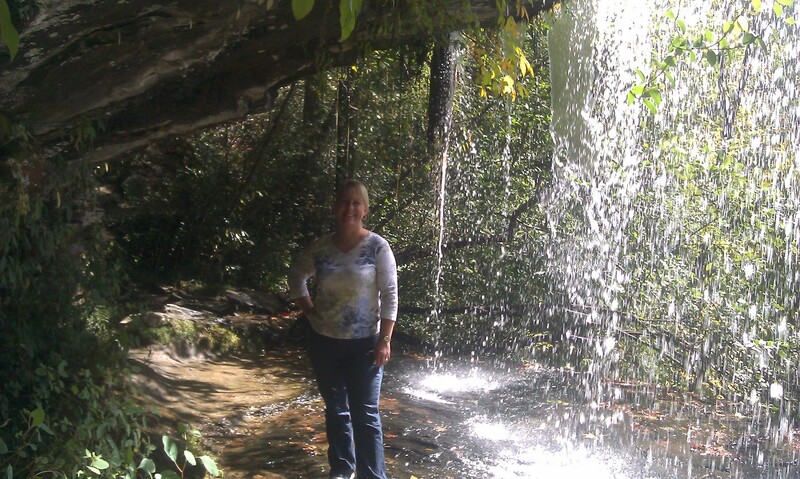 The first hike I did of any length was the Abrams Falls trail in Cades Cove. The trail is 2.5 miles to the falls for a five-mile total. 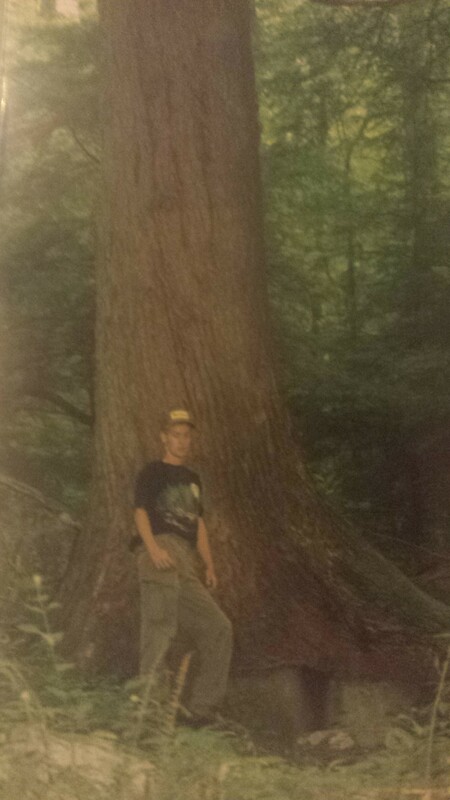 I guess I was around 12 the first time I hiked it. 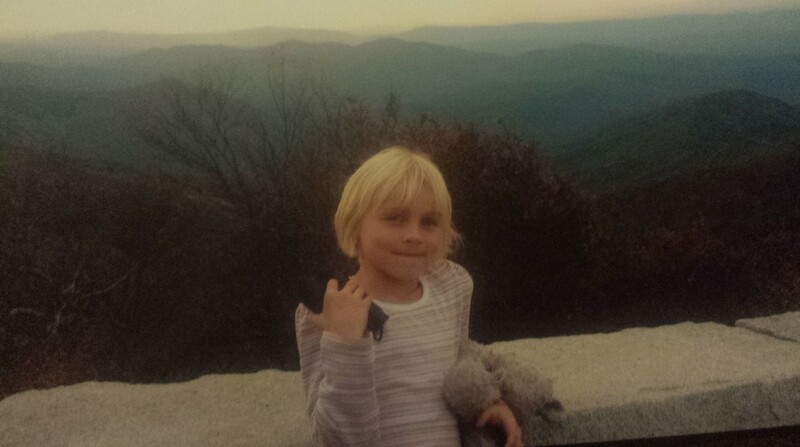 I was with mom, dad and maybe Brandon but I remember it being a long hike. It was a rewarding hike though. I like having a reward waiting on me some where on the hike. This time it was a high shear falls on a large creek with a swimming hole at the bottom of the falls. We were not prepared to swim but dad let us get a little wet. 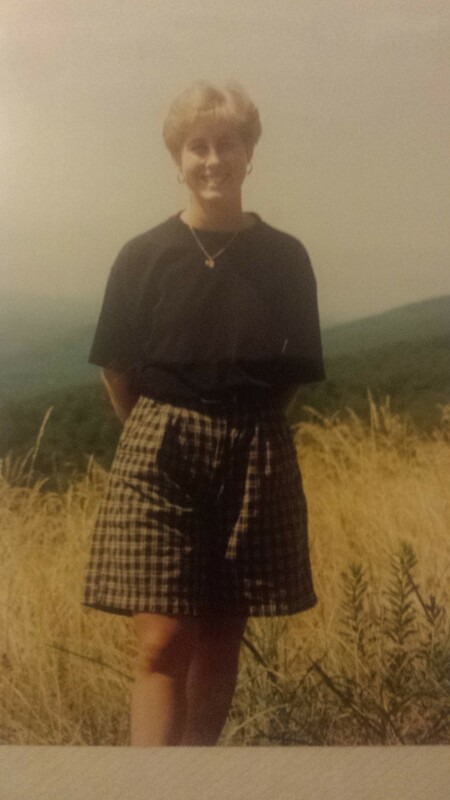 Years latter Wendy and I did some camping at Cades Cove campground and made the hike together. After we got married I would drag her all around the cove looking for deer and bear. She was a real trooper. We had lots of fun. 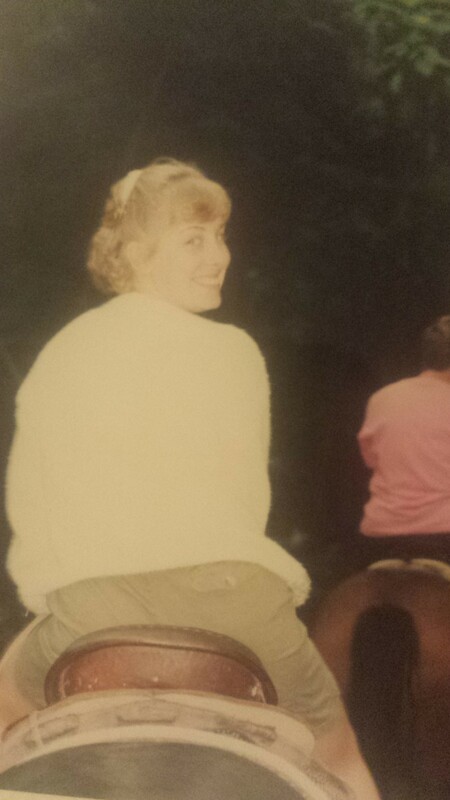 We even rode the horses. I have camped at the Cove so many times with Wendy and without her it is hard to keep all of them straight. I do remember one trip and I think it was before we were married so I had to be 18. Bobby Watson and I drove up in his straight shift Ford F 150. I drove most of the way but I had not driven a straight shift much, other than the farm tractor, and almost forgot I was driving a stick when I went to get off the highway because I had been in fourth or fifth gear for so long. We had gone up after work and got to the park late. The sign at the beginning of the seven and half mile road to the campground said the campground was full but we went on any ways. It was about 10 PM when we pulled in and the ranger station was closed. We drove the campground and it was full, not a spot was open. We did notice at one of the group camping area that there was only a small number of people occupying less than half the space. We asked if we could use the area they were not and they agreed. We paid them maybe $20 for the use of the spot. Some how Vance Keys was with us. He must have followed us up in his truck. The next morning we decided to hike up the Anthony Creek Trail to Bote Mountain trail to the AT at Spence Field, 4.8 miles away. We had no idea what 9.6 miles were in the Smokies. We were very under prepared. We may have had some bottle water, a can of tuna with crackers and maybe an apple. We did not have a backpack, we carried what we did have in our pockets. It was a very nice walk, all up hill as we climbed up to the ridge top. 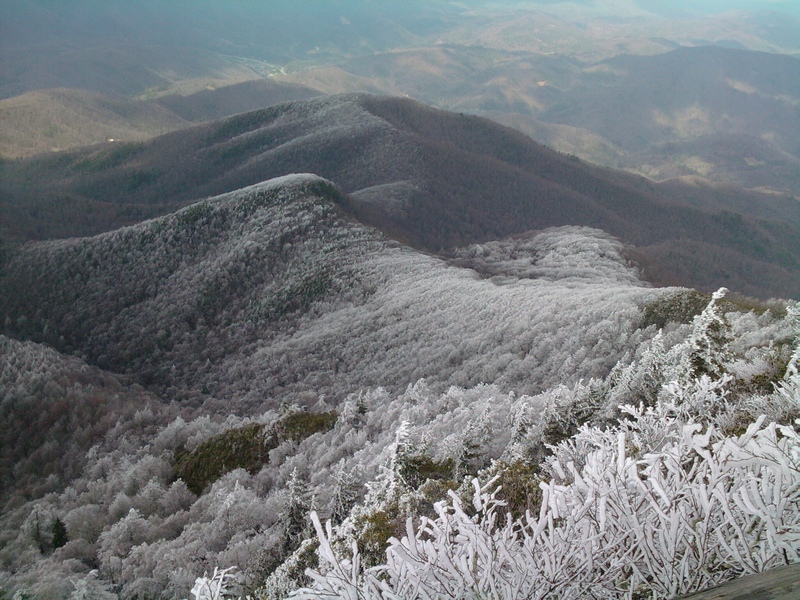 The AT runs the highest ridges of the Smokies, forming the boundary between Tennessee and North Carolina. It was not as steep as other approach trails but a nice grade. We came to some virgin timber. There were trees that it would take three men to hold their arms around. Once we got to back country camp site number 9 we decided to turn back. We had only walked 2.9 miles but that was enough for us. Once we got back to the campground we were able to get a camp site of our own. 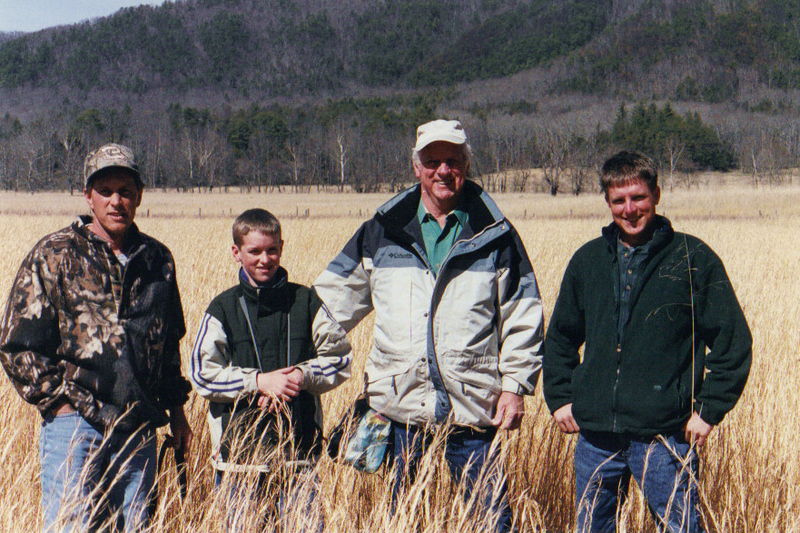 The other special camping trip in Cades Cove was Wyatt’s first camping trip. 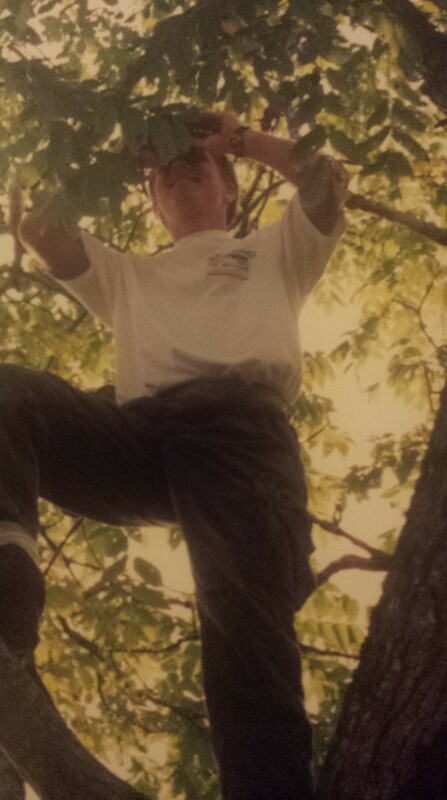 This was in 1998 and we were still tent camping. 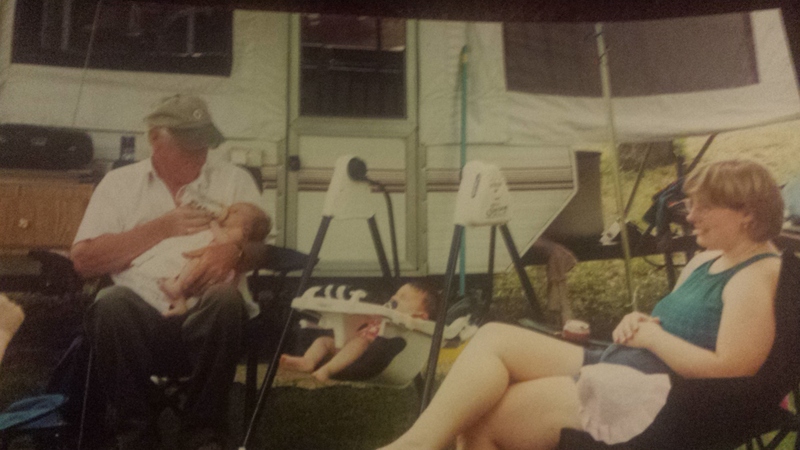 Wyatt was 6 or 7 months old and we had his play pen set up in the tent. He and Sarah both have camping in their blood. They have been doing it their whole live. 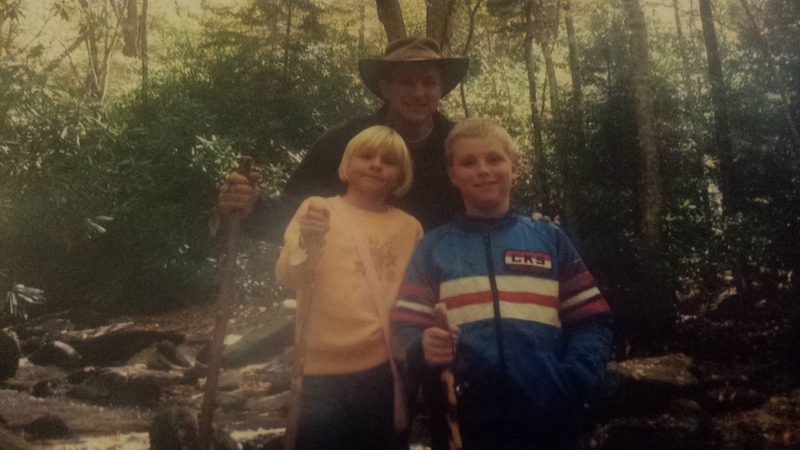 Sarah was younger than Wyatt on her first camping trip. She was only four months old. 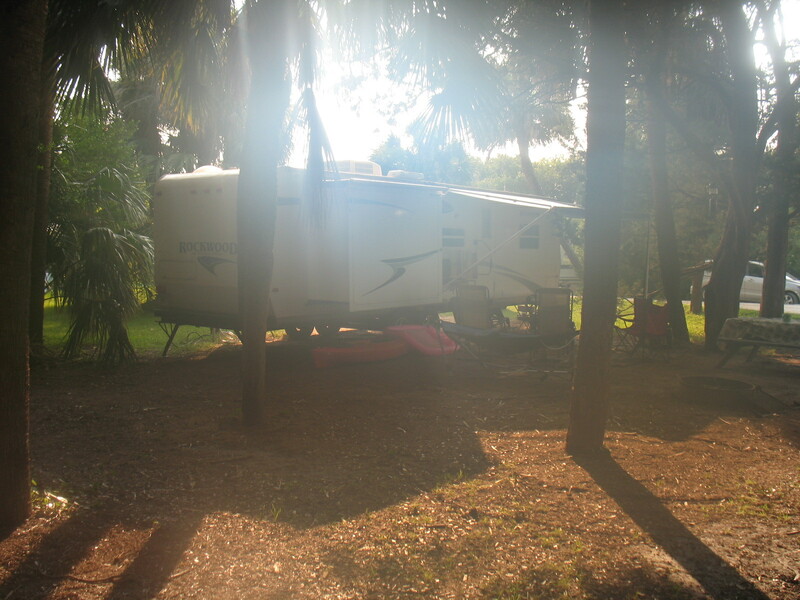 We did have the pop up camper by this time and we were camping on Raccoon Creek at the Ford. She slept in a basanet on the counter top of the small camper. We now have a 32 foot, double slide travel trailer. We go RVing now, not camping. 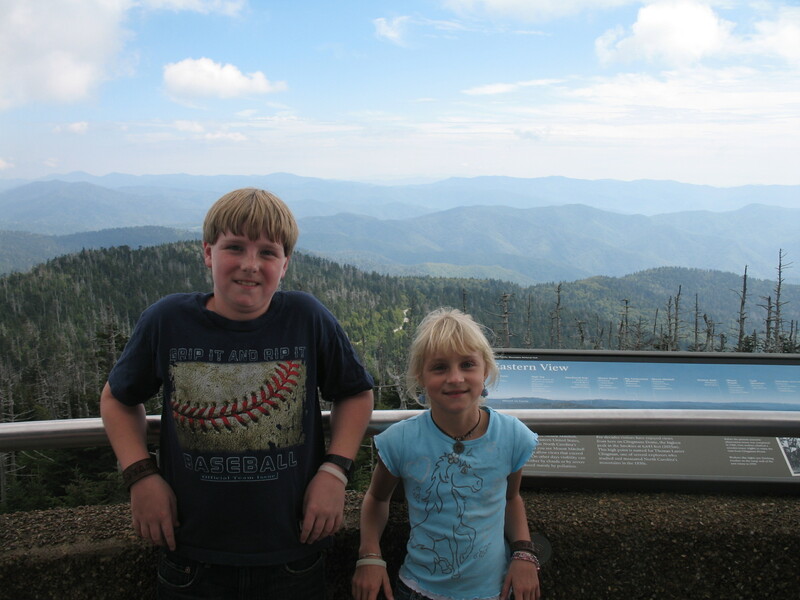 Like I said, we vacation a lot in and around the Smokies. For several year we would rent a large cabin that sleeps up to 20. 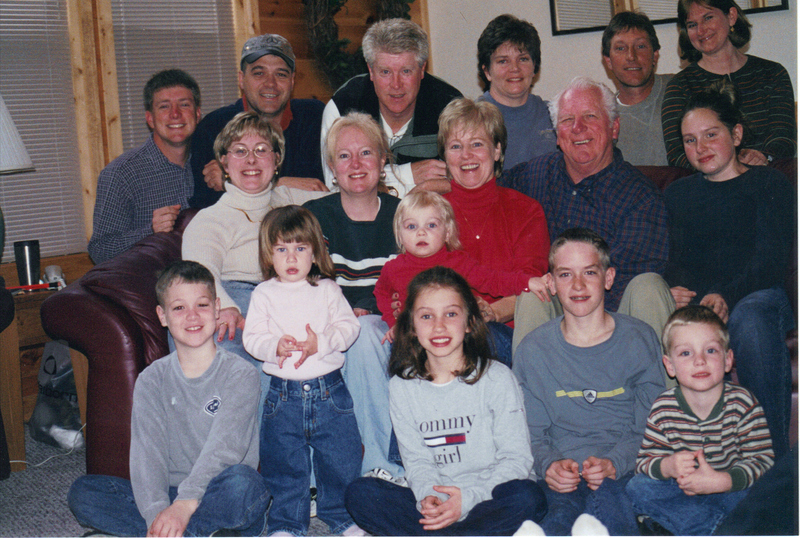 It would be: Mom and Dad, my sister Tammy and her husband David and their son Alex, my brother Todd and his wife Toni and their son Zack, my brother Keith and his wife Sonya and their daughter Ashley, Kaitlin and Hannah, Wendy, Wyatt, Sarah and I. Then there would be a few friends added each trip. Most of the time we would go in September or October. 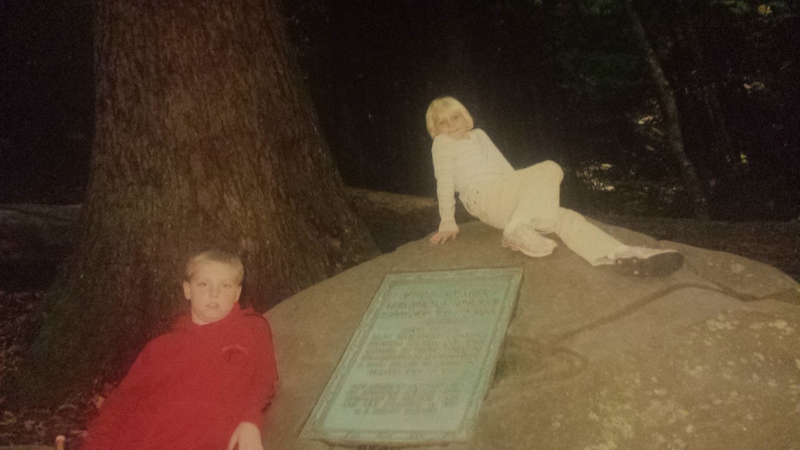 In the fall of 2006, Wyatt, Sarah and I went up early in the day and everyone else was coming up in the afternoon. I had planed on us hiking the Alum Cave Trail. Sarah was six and Wyatt was eight years old. We stopped at the visitor center at Sugarlands and bought us all hiking sticks. The kids had a bell on their’s to keep the bears away. 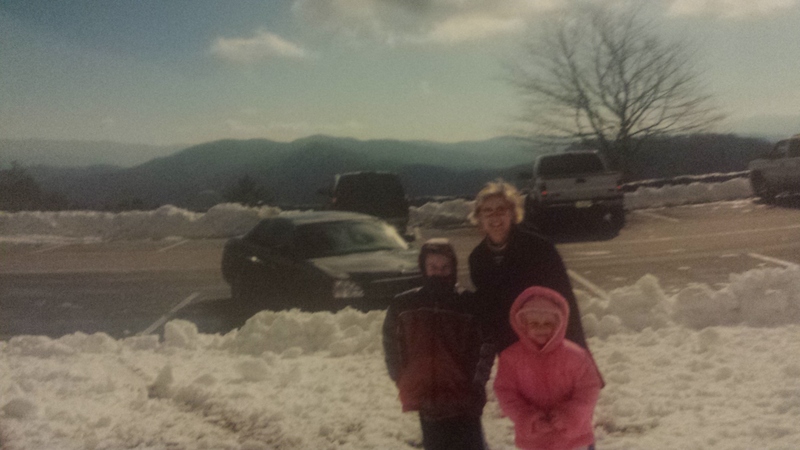 When we got to the trailhead parking lot on Newfound Gap road it was packed with cars and people. I parked on the shoulder of the road. We got out and got our things, locked and shut the doors. That is when I knew I had locked the keys inside. At that time there was no cell phone service inside the park. I thought if I could get high enough, I might just get a signal. The three of us with our sticks in hand hit the trail. It was not to bad of a climb. The trail follows the small Alum Cave Creek for a mile, then follows Styx Branch for a half mile. The trail then hugs the side of the ridge for a little more than half mile to Peregrine Peak. From there it is less than a half mile to the cave. 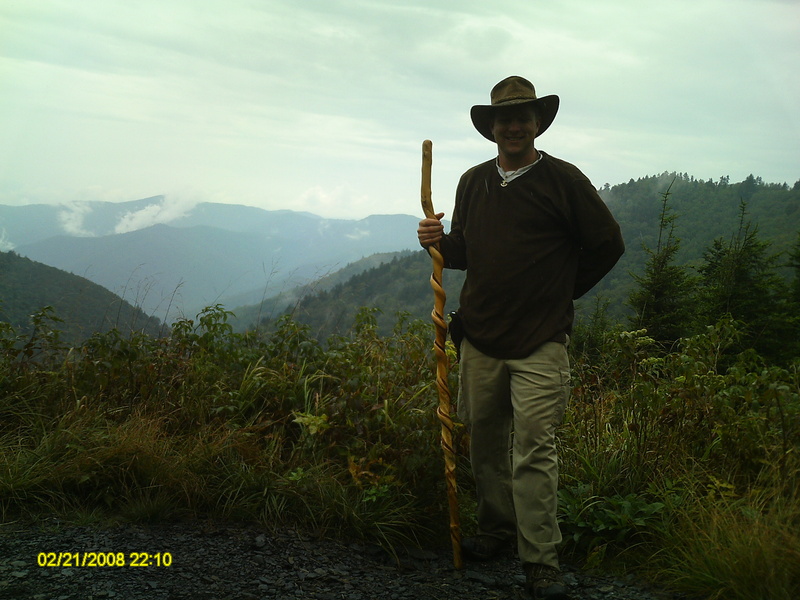 From trail head to the cave is 2.3 miles and another 2.7 miles to Mount LeConte, the second highest peak in the Smokies at 6593 feet. Not to far up the trail we came to a surprise, Arch Rock. It is a natural tunnel that the trail goes through. The trail first crosses a foot log over the small branch and straightway enters the tunnel. The tunnel also goes up hill so you exit higher than you entered. Very cool place. We make it to Peregrine point. We have a fantastic view north of the West Prong Little Pigeon River watershed and Newfound gap road. The next ridge over is Little Duck Hawk Ridge and we can see another arch in rocks on top. Our next surprise was at the Alum Cave Bluffs, there was not a cave but high overhanging cliffs. This worked out good for me. The Bluffs created a huge satellite receiver that collected cell phone signals. I was able to get a phone call out to Tammy. I told her what had happened and where we were. They were going to met us at the truck with a locksmith. After checking out the view for a while we stated back down. Due to no fault of her oun, Sarah’s paints got wet. To keep her from chafed her legs while walking, I carried her the 2 miles back to the truck. Lucky we had the suitcases in the back and were able to change Sarah into dry pants. Tammy, Dad and the locksmith arrived about 40 minutes later. 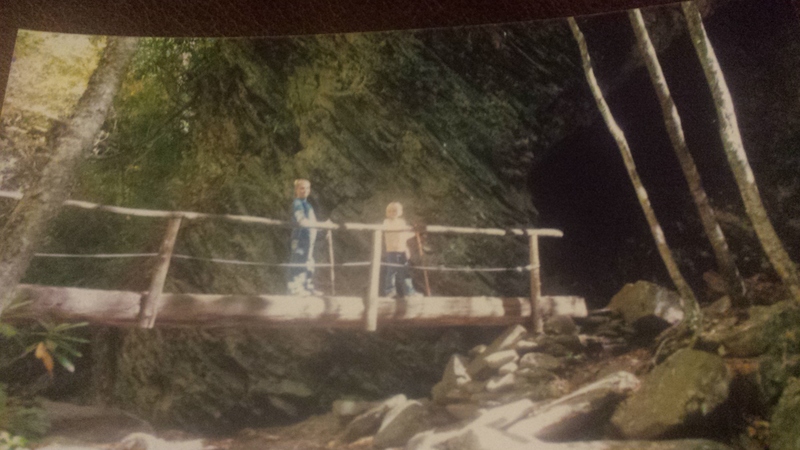 Some years earlier, Wyatt and I tried this trail after a snow storm. The day was warming up fast and the trail became a mess. 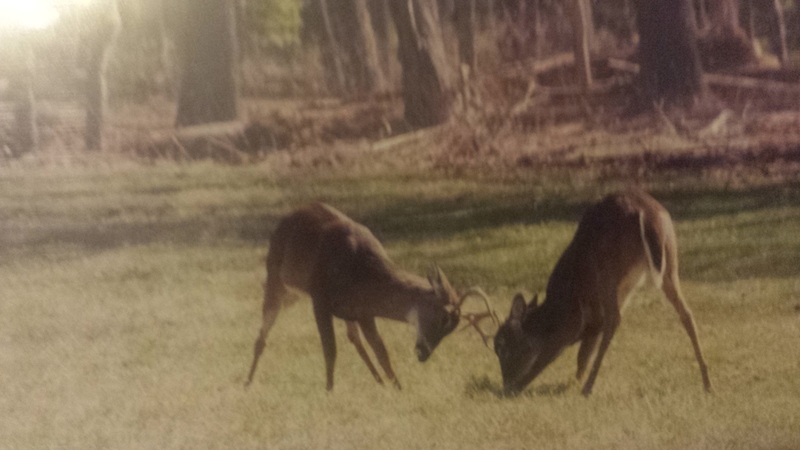 He had on good shoes and I did want to get them nasty so we turned back after just a few dozen yards. I believe we drover the Roaring Fork Motor Nature Trail where he fell asleep. A Falcon Guide call the ridge Bluffs trail the best in the park. 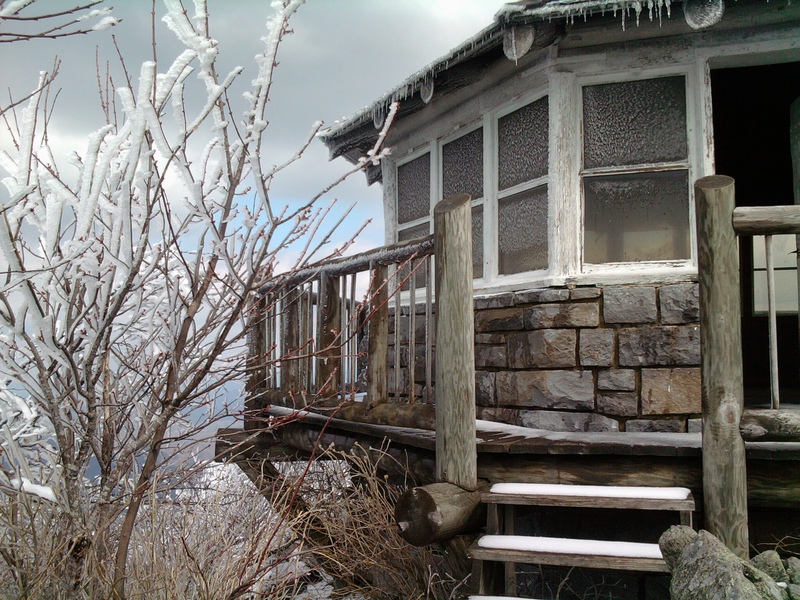 If you go all the way to Mount LeConte I bet it is, because you will see a little bit of what the Smokies have to offer. As on all other trips we made our way to Cades Cove. We had a picnic with the whole family. On the return trip home, Wyatt, Sarah and I drove the Foot Hills Parkway. 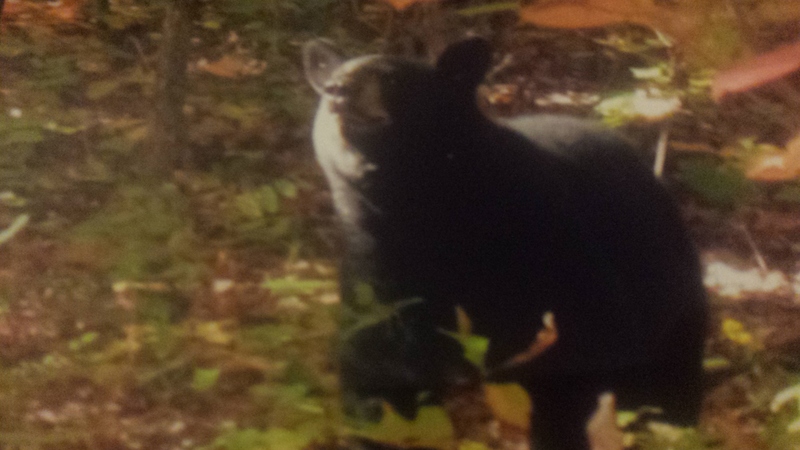 We drove true the Look Rock camp ground just to check it out and saw this Blake Bear. It made the 13 Bear I saw on the trip. We also stopped at the Looking Rock overlook. We then drove the Dragon Tail on Hwy 129 to Deal’s Gap. From there we went to the Joyce Kilmer Memorial Forest. A 3,800 acre old growth forest. We checked out some of the big trees. Then it was on to house. It was 2008 and Labor day was coming up. Wendy and I had talked about doing some tent camping and getting back where the camper could not go. When it was time to go she had changed her mind and did not want to go. So I decided to go hiking on my own. 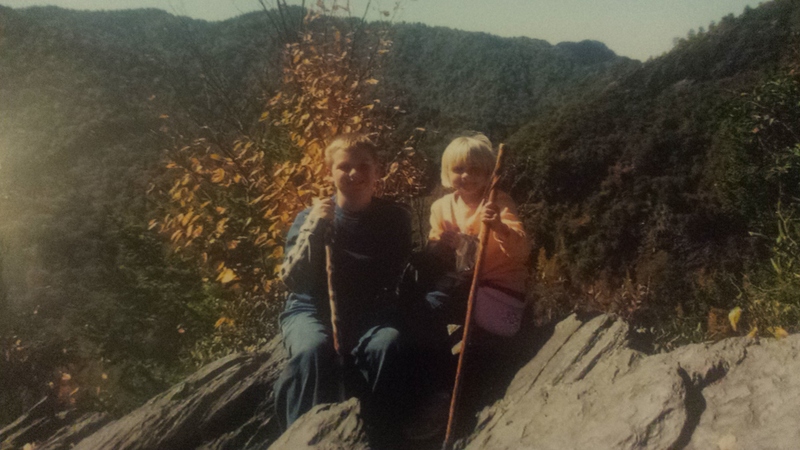 She had gotten me a pack for Christmas a few years earlier and I had been doing some hiking in Georgia on the AT and around. I had gotten maps and guide books also. I was a much better prepared hiker than before. My pack was setting on go so I grabbed it and headed on the road at 5 PM on a Thursdays. 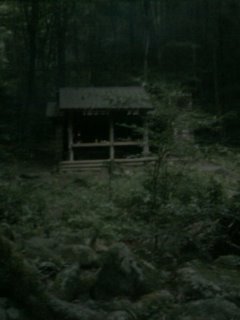 I drove up to north Georgia to a few campground around Blood Mountain that I knew of but all were full. 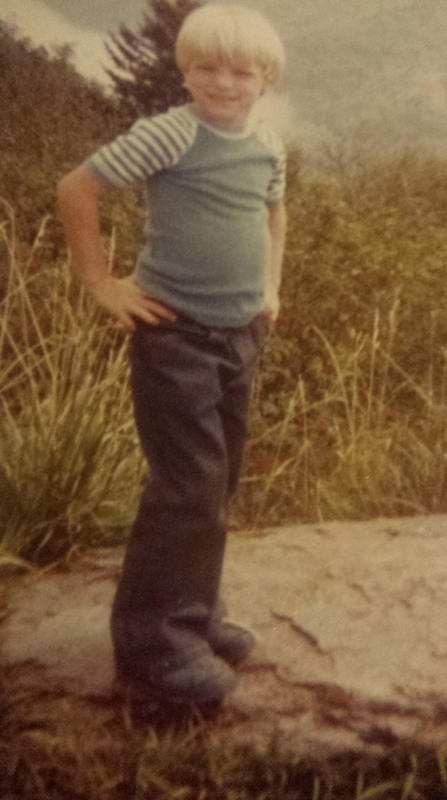 I then decided I would climb the mountain and camp on top. I had been on Blood before and knew where I was going. It was already dark and was around 10 PM before I hit the trail. From Neel’s Gap to the top of Blood is 2.4 miles up the AT and a gain of 1335 feet. I had to park a few hundred yards below the gap so I had to climb a little more. There was a full moon and I climb with out a light. It didn’t take long for my eyes to adjust and I could see extremely well. It was a neat experience. I was traveling west and the moon was behind me. When I got to the top around midnight the moon was high above. I could see the sounding mountains from the rock outcropping where I setup camp. 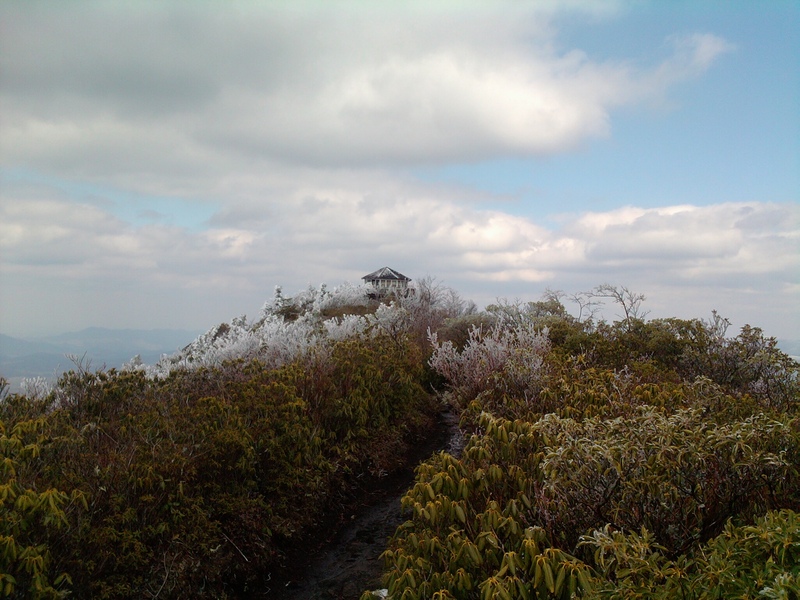 Blood Mountain is the highest peak on the AT in Georgia. 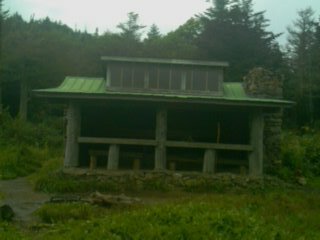 There is a shelter at the top but most people camp in the woods around the peak. I was on a smooth granite rock slab with a little slant. I started a little camp fire from a dead pine tree just to settle down. The next morning I saw the sun rise over Cowrock Mountain. I pulled out my maps and guide books to figure out where I was going to hike. I needed to do a loop so I would not have to back track. I found where I could make a loop on the AT in the Smokies, starting at Newfound Gap. I packed up camp and headed back to the to the truck via Neel’s gap and the Walasi-Yi Center where I picked up a few supplies. Then it was down the road to the truck. After driving to Newfound Gap, I park the truck in it’s large parking lot. It was here that the Park was officially dedicated by President Roosevelt in 1940. 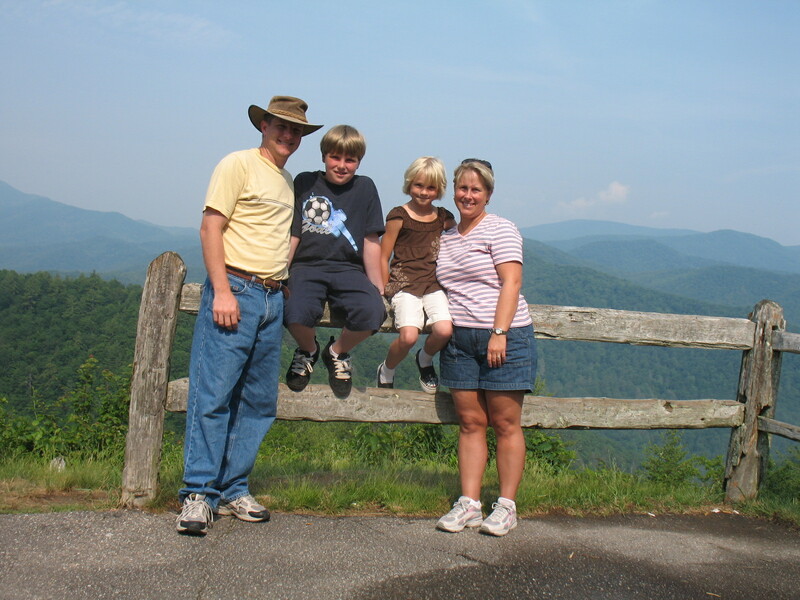 It was also here that I would get my photo taken standing on a rock with a hole drilled in it over looking the Oconaluftee river valley every year we came during my childhood. The AT crosses here too. I took it north. There is always a lot of people on the trail near here. People just want to say they have hiked the AT if only for a mile. The crowd thins out after that first mile. Their flip-flops and sandals start to hurt their feet. 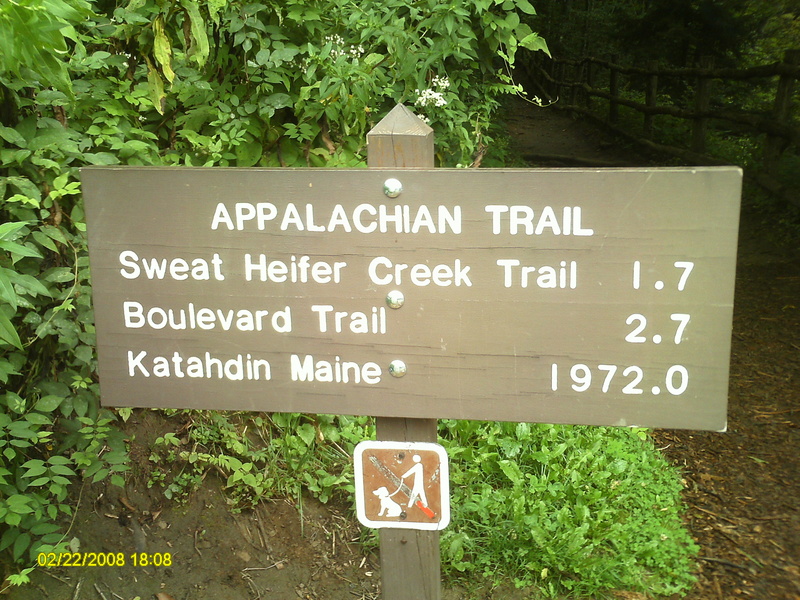 The first 1.5 miles ascends to a grass knoll then its 0.2 miles to a junction with Sweat Heifer Creek Trail. This is where I depart from the AT and head down into the Valley. I saw no other soul on this 3.7 mile trail that drops over 2200 feet. In fact it didn’t look like the trail had been used much at all. It was getting dark when I reached the Kephart Shelter. I asked if there was room for one more and there was. I was surprised at how many people were at this shelter, especially since I had not seen anyone in hours. This was the first time I ever stayed at a shelter and had no idea at the time you needed a reservation to stay at shelters in the Smokies. I ate my dinner and it started to rain a little so about all there was to do is to sleep. The next morning I pack up, and cross the foot log over Kephart Prong Creek to start Grassy Branch Trail. The trail gains over 1800 feet in 2.5 miles. Looking at a cross-section of the elevation change with mileage of the Sweat Heifer Creek trail and Grassy Branch trail, it is a 45 degree decent on the Sweat Heifer and a 45 degree assent on the Grassy Branch. It looks just like a huge “V”. It was a hard slow climb, but there were great views on grassy hill sides and long sunken Rhododendron tunnels. The blackberries were ripe and I would fill up when I would come to a patch. I only saw two people before reaching the AT and it was a couple on this trail that caught up with me. I told you I was moving slow and that you could find solitude. 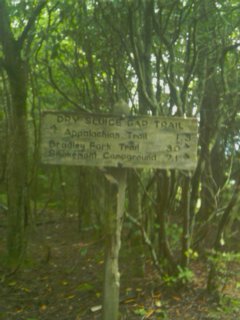 When I got to Dry Sluice Gap Trail I took a left. From here to the AT the trail runs the ridge and is not as steep. Part of the ridge is like a knifes edge. I had never seen anything like it before but the ground dropped off on both sides of the trail. I have seen other areas like this since but none have been this narrow. I stopped and ate lunch here and one of my cans dropped and was gone. I could here it bouncing a long way down. The trail was only a mile long and I turned left back on to the AT. 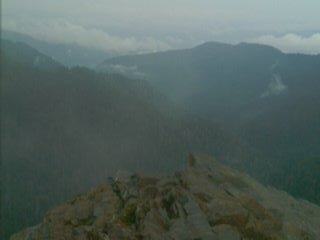 From here it is 0.4 miles to the side trail to Charlies Bunion. This is the coolest place in the park. It is a short half mile long ridge that drops of sharply on all sides. At the tip is a huge rock you can get out on and have a 300+ degree view. What created this unique area was a fire in 1925 after the logging of this part of the park. With no vegetation to hold the soil to the steep ground a 1929 heavy thunder-storm washed all dirt off the hill-side. Horace Kephart joked that the jagged cliffs reminded him of the foot ailment of his friend Charlie Conner. That is where the name came from. The trail out to the point is very narrow with a rock wall on one side and a drop off on the other. One wrong step and you’re gone. The view from the rock overlooks the Little Pigeon River Middle Prong watershed all the way down to Greenbrier. 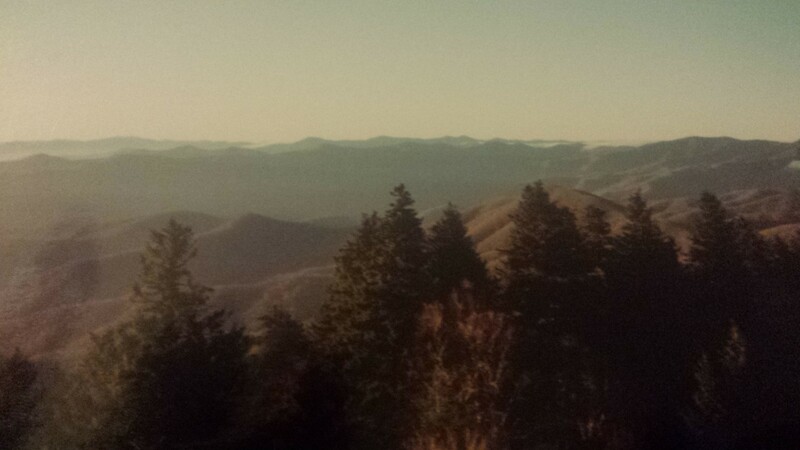 Mount LeConte is to the left with a good view of the Boulevards. The main Ridge of the Smokies is to the right. From here it is only 4 miles back to the Newfound Gap parking lot on the AT. It would make a good day trip or over night at Ice Water Spring Shelter. The shelter is only a mile up the trail. Just before the shelter is Ice Water Spring coming out of an old pipe and dumping on the trail. 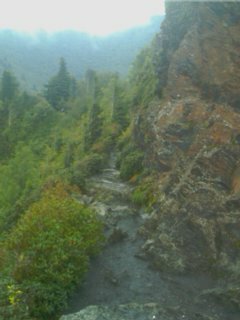 It is unusual to see this much water coming out of a spring on top of a mountain. It has been raining on and off all day and my feet are soaking wet. I found a little dry wood and start a little fire in the shelter to dry my socks and boots. I gather more wood and dry it by the fire. I had only been 4.5 miles but over half of it was climbing out of a 1800+ foot wet hole. I was a little tired. I hung around the shelter resting. The rain was over. The shelter had a nice view west but not as grand as other areas I had seen this day. As I was drying my socks, two ladies came into the shelter carrying a watermelon. Now remember the shelter is 3 miles from the nearest road. They carried a watermelon that far just to eat it at this shelter. They must like watermelon. I would see a few groups pass ever once in a while, but the rain must have kept a lot off the trail. On into the afternoon a young family came into the shelter for the night. 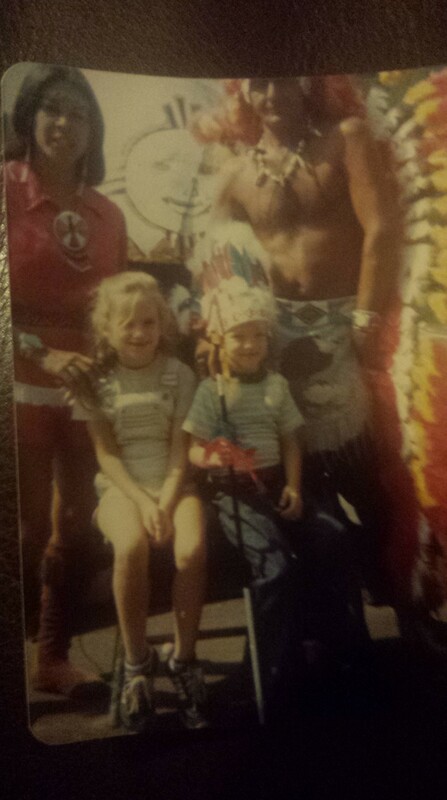 They were from Marietta not far from where I live and had a little boy and girl. The children were very well-behaved and had good manners. The lady said she thought the shelter would be full because when she made reservations she got the last four spots. Wait, what, reservations? This was the first I had heard of needing reservations. This is my land, I pay taxes, why do I need a reservation. I did not say anything to her. Just so you know you should make reservations when backpacking in the smokies at any shelter or back country camp sites and camping is only allowed in these areas. Reservations are free. The rest of the AT is free game, camp where you want. 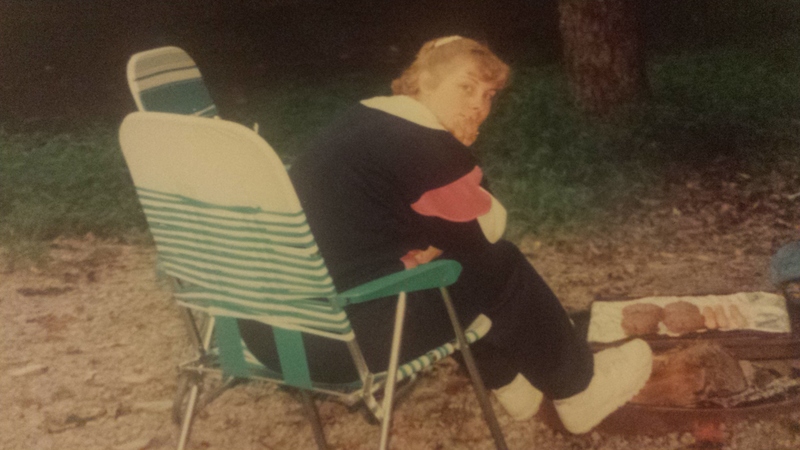 I have made reservations for every other camping trip in the Smokies from then on, I may not have stayed where I had reservations but I had my reservations number. It is also nice to have if the shelter is full. You boot out who every does not have one. I have not had to do that but I have been in shelters that are maxed out. No one else joins us, it’s just the five of us for the night. The view from the shelter was good and the grassy meadow around was lovely but what a terrible design on this shelter. 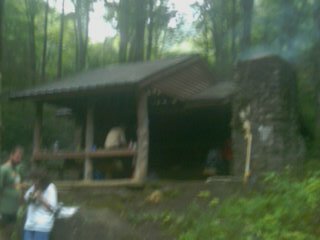 The shelter like most in the Smokies has three walls, roof, fire-place and an open front with two sleeping platforms stacked on one another. This shelter open wall was facing the north-west. Cold wind blowed on us all night. Sunday morning, I took my time packing up before getting back on the trail. Right after the Boulevard Trail junction is the highest point on this hike at a little over 6000 feet, on Mount Ambler. 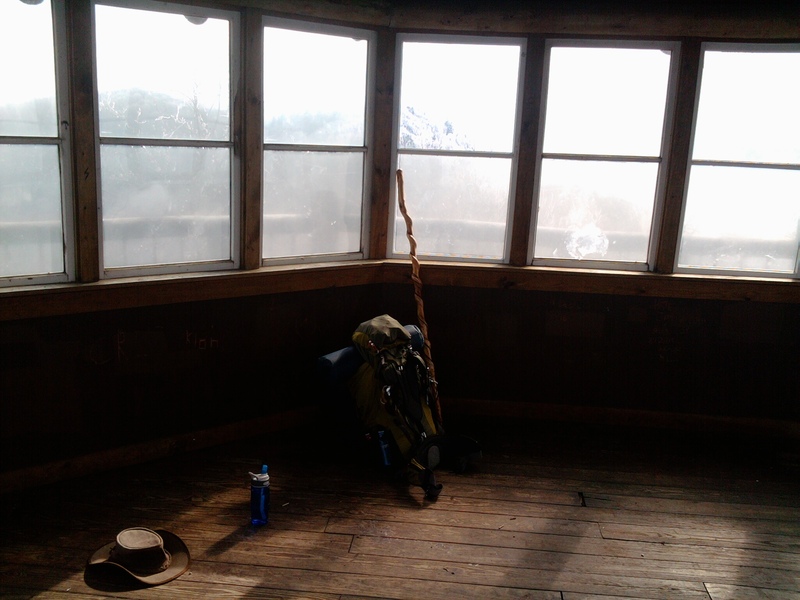 Kephart shelter was the lowest at 3500 feet. I dropped over 2500 feet and climbed over 2500 feet. 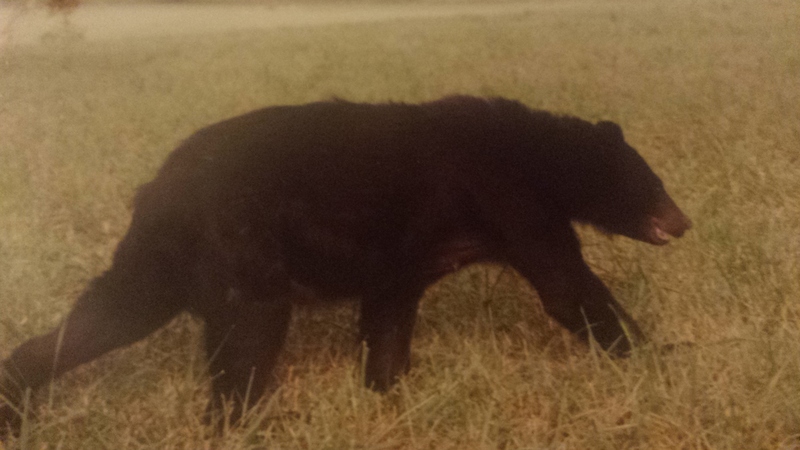 Along the AT back to the parking lot I saw a Black Bear with a cub. They went over the mountain and I didn’t see them any more. I did see what is called a ridge runner. They are volunteers for the most part that travel the AT cleaning up around shelters, educating hikers and being eyes and ears for the park service. She asked me where I stayed the night and if I saw any bear. I told her about the two I saw. Then she was off. The strange thing was a few months later, I read an interview about this same ridge runner in Blue Ridge Outdoor magazine. She said that over the past year that she had spent over some thing like 300 nights on the trail. As I got closer to the parking lot I started seeing more and more people. I got right at the edge of the parking lot and was stopped by an old oriental man who wanted to take my photo. I guess I looked like a really AT through hiker to him. Newfound Gap is always a must see. It is the highest point on the road from Gatlinburg to Cherokee. It receives a range of 43 to 106 inches of snow a year. It sits on the North Carolina and Tennessee state line. 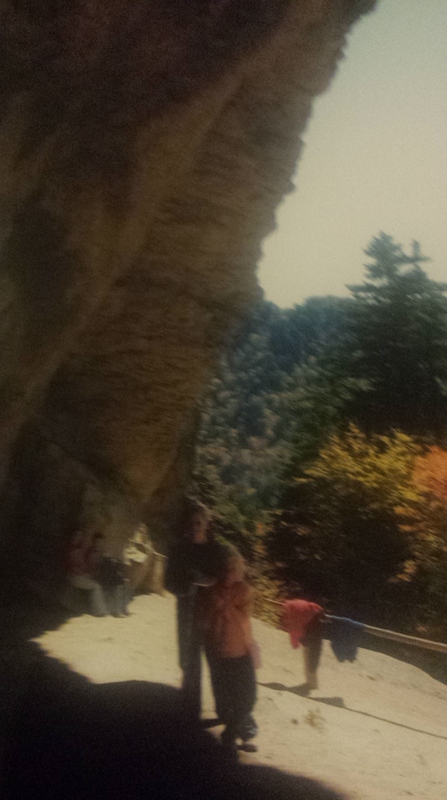 Cherokee Indian reservation is also a must see. 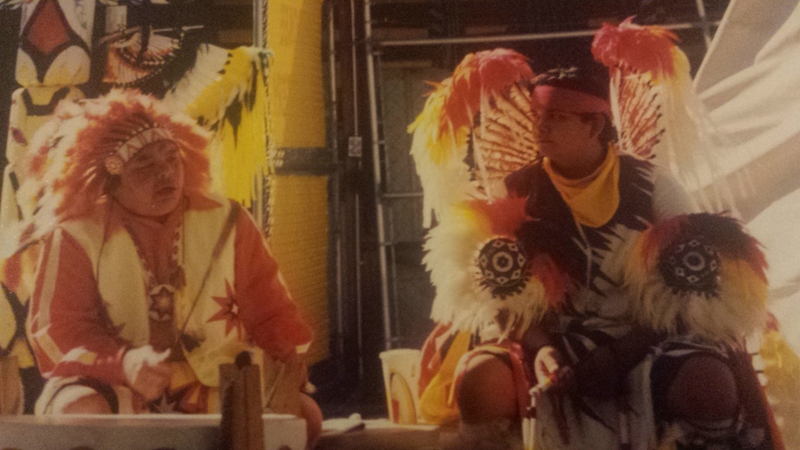 It is the home of the Eastern Band of the Cherokee Indians. The southern end of the Blue Ridge Parkway starts in Cherokee. The museum does a great job of telling their story. The Oconaluftee Indian Village is a living museum that demonstrates traditional indian life. I remember visiting it with mom and dad on one of our many trips. We saw a demonstration of starting a fire with a bow and a stick. I still need to try to do that myself. After my first hike on the AT in the Smokies I picked up a book called “100 hikes in the Great Smoky Mountains National park” by Russ Manning. On the cover was a photo of Mount Cammer Lookout. It is the coolest thing. It is a two-story fire lookout that would look more at home in the Rockies. I had to go. I planed out the rough I would take that would be the easiest and fastest way to the lookout. The trip was planed for April of 2011. Driving up I was on the cell phone with Wendy because I knew there would not be any service in the park. I was on I 40 and came around a curve where I had a good view of the mountains I was about to climb and the tops looked white. I didn’t think there would be snow in April. I told Wendy looks like I will be hiking in snow. The Trail head for Chestnut Branch is at the Big Creek Ranger Station. I did the self checking at the information board. It is 2 miles to the AT and another 3.3 miles to the side trail for the lookout. The whole way is a 45 degree slop and a litter steeper just before the trail junction. I was 1500 feet above sea level at the rangers station, the trail junction for the lookout is a little over 5000 feet and I hit snow around 3500 feet. Climbing 3500 feet in 5.3 miles is tough. Hiking in snow is fun but it is cold. When I got to Mount Cammerer trail the show was at least a foot deep and ice was on everything. 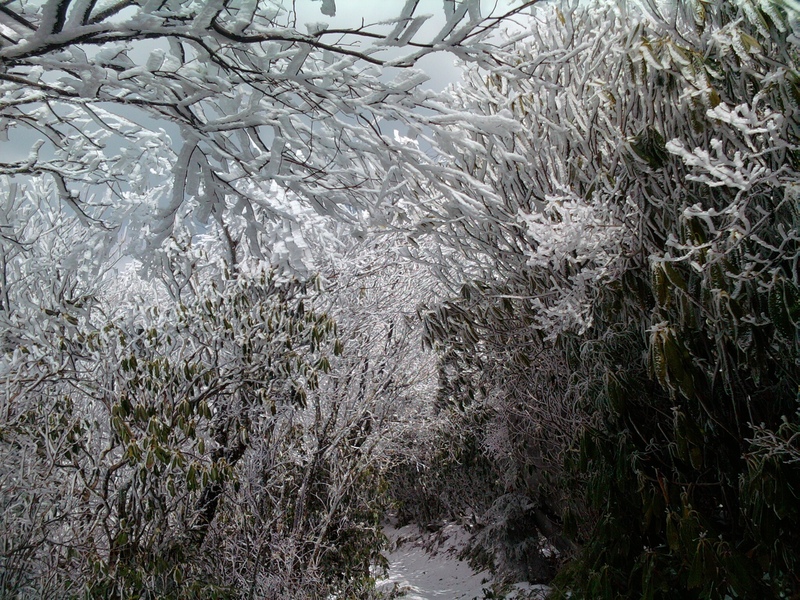 The 0.6 mile trail to the lookout was covered by ice encased trees and shrubs. It was like walking in a freezer. The ridge I was on was the northern most and had no protection from the north wind. The flat Tennessee Valley lay below me. The wind would rise up from it along the north side of the mountain and blow over the snow and ice before reaching me. The wind chill had to be below zero. I keep thinking if I could get into the lookout I could get warm. Once there it did not disappoint. The last 100 yards was open and rocky. The lookout was on the point of the ridge called White rocks. 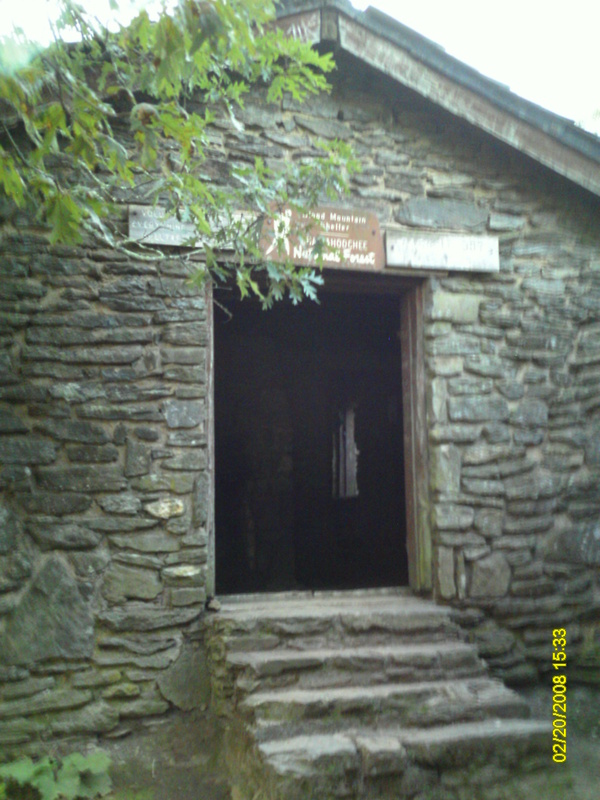 It was built-in 1939 by the CCC and in use to the 1960s. A restoration took place in 1994. It also has been listed on the National Register of Historic Places. After a lot of photos I went in to get warm. The wind was not blowing but the single pane windows did not keep any heat in or cold out. I sat on the floor and ate my lunch and used my stove to try to keep warm. It did not work. One other guy came by while I was there. He was a day hiker from Cosby Campground and didn’t looked dressed for the weather. He did not stay long. After eating I decided I would freeze to death if I did not get out of there. I pulled out all the cloths I had and put them on. I was so happy that I had stopped on the way up at the NOC and bough a nice warm bogging. 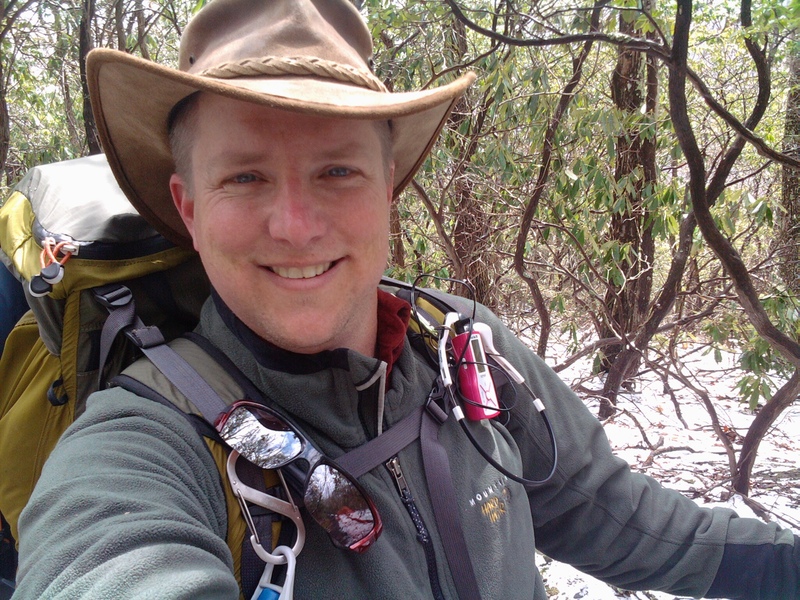 It was now a race to get to Cosby Shelter on the AT before night fall, 3.5 miles a way. It was 2.1 miles down hill to Low Gap. I was in subarctic conditions with the snow, ice and wind. I had my parka zipped up to my nose and the hood pulled down tight. Sunglasses covered my eyes. Nothing was exposed. Boy was I tired when I got to the shelter. It was a four-hour drive to get to the trail head, a 9.4 mile hike and a total of 4,500 feet gain in elevation. The shelter was very active when i walked up. I took one of the last sleeping spots. Me and Two other guys were the only section hikers. The rest was Northbounders. There were about ten or twelve of them, four or five girls and four or five guys and at least one couple. I think one of the girls was from Australia. Several others from Virginia. Two guys were local boys and were getting off the trail at the end of the Smokies. They were all ready to get out of the Smokies and they were tired of the snow. They had a good fire going and this shelter had tarps across the front to help keep in the heat and the cold wind out. This shelter was positioned right. It was on the south side of the ridge and sat just low enough below the ridge top to be out of the north wind. It also faced south. In side the shelter was very warm. I ate dinner and hung my pack on the bear cables. I have not been to any, but there are shelters in the Smokies with chain link fencing around the open wall to keep bear out. All shelters have mice. They will get into you food quicker than a bear. What you have to do is tie any small bags that you may have snacks in on small strings hanging from the ceiling. The mice may not get it then. You will feel them running around at night but you are so tired you don’t care. When we wake in the morning there is a fresh 3 inches of snow on the ground. From the shelter I have less than a mile of up hill climbing. The rest of the hike will be all down hill. Once again I am bundled up fighting the cold. I pass more Northbounders and wish them luck. One or two of them had to be in their 60s. After 1.6 miles I reach Camel Gap. I take a left and head down Camel Gap Trail in to the Big Creek watershed. I am dropping altitude fast and soon I have to come out of a lot of cloths. It was a totally different world from on top of the ridge. I was now in the protection of the vallies. The trail is 4.1 miles long, all down hill. 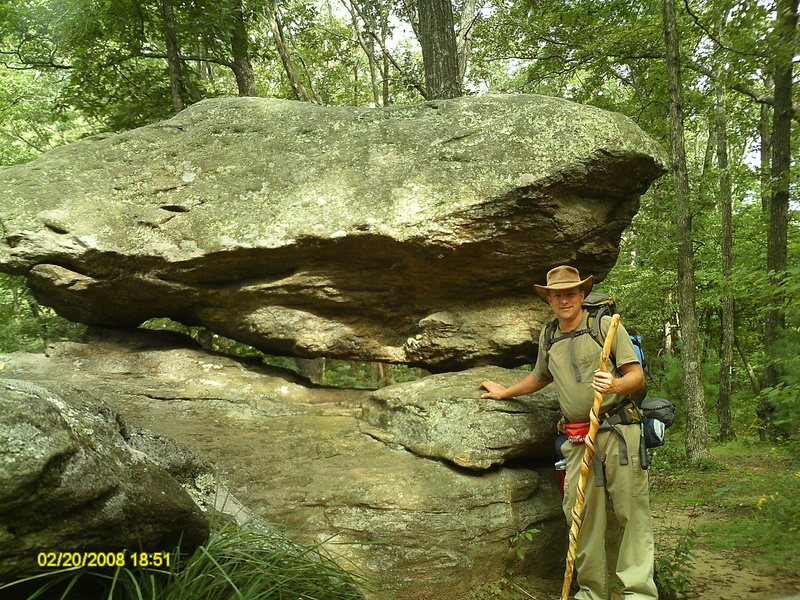 Once I reach Big Creek trail, it is only a mile to my camp site at back country site 37 in Walnut Bottom. I have my hammock with me on this trip and I find a good spot close to the creek and take a nap. After my nap, I started scavenging for fire wood. The forest around any camping area is always picked clean of any down wood. You have to travel a good little ways out side of camp to find wood. There are a few tricks that you can do that a lot of people don’t think about. Like in this location, I check the creek for drift wood and find enough to supply me throughout the night. The drift wood has been stripped of its bark and dries faster than wood on the ground with bark. I also look for standing dead trees. Some people think you can cut a tree and put a match to it and it will burn. I am amazed that people do not know how to start a fire. It’s such a basic skill. I never, never, never ever use store-bought fire starters. Most of the time I start with tooth pick size sticks and work up. Sometimes I use my knife to make wood shavings, then make a bird’s nest. Only if the wood is wet will I do this. If I get to the camping area early, I will check each fire pit at each site for unused or half burned wood. Even if I only get charcoal, I can use it to help start a fire. The charcoal burns hotter than wood. Another trick I learned from my grand dad via my dad is to find dry wood in hollow trees. If my wood is wet, once I get my fire going I will stack it as close as posable to the fire to help dry it out. Sometimes I will make at tepee structure over the fire to dry out the wood. If there is an old pine tree stump, you can bust off the rich wood we call “lighter pine”. It will burn better than anything. A fire is not always needed but to me it is part of the experience. There are a few other groups of campers around but I am more in the woods and can’t really see them. They are here to fish the creek for trout. After I get my fire wood up, I reset my hammock and set up my tarp over it. I eat my dinner and relax by the fire before going to sleep. Once you get the hammock with the correct tension, it is the best way to sleep in the woods. I put an air mat inside first, this helps to keep the hammock rigid. If there is not an air mat down the hammock will roll up around you plus it keeps the cold off your back. 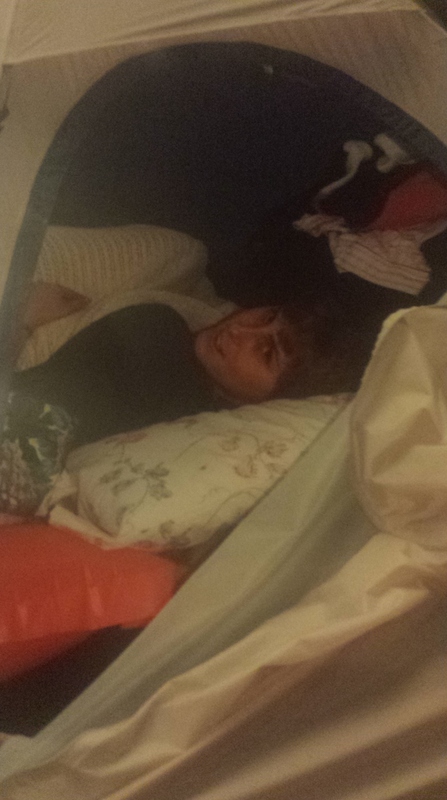 I then put in my sleeping bag. The tarp is only a few inches above the hammock. It makes a great “tent”. I will never go back to sleeping on the ground. The next morning I packed up and headed out down Big Creek trail following the Creek. From the Camp site back to my truck is 5.9 miles. The trail is an old CCC road built on an old logging train track. The trail is very wide and is an easy slop. It drops only 1500 feet from top to bottom. Only a few areas of note on the trail other than the creek itself. First is Break Shoe spring. Named for the train break shoe placed by a logger to collect spring water. The brake shoe is long gone. There are two very nice bridges over the creek that would support the largest of trucks. I ate lunch at the lower one. Mouse Creek Falls and Midnight Hole are the other two highlights. Once I reached the Big Creek paring lot it was a 1/2 mile down the road to the ranger station and my truck. The next November I was back in the Smokies on another two night hike. 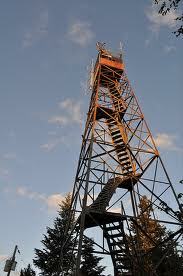 This time it was to the Mount Sterling fire tower. I started out on the Little Cataloochee Trail off of Hwy 284. The trail descends steeply and crosses Correll Branch then back over a ridge. At mile one, Long Bunk Trail comes in on the right. This is the trail I will return on. Another 0.2 miles and I come to John Hannah Cabin, a reminder of the old community that was once here. I explored the cabin but it is like most in the park and I rejoin the trail in short order. In 0.3 miles I cross Little Cataloochee creek at the old community of Ola, named after Will and Racfhel Messer’s daughter Viola. 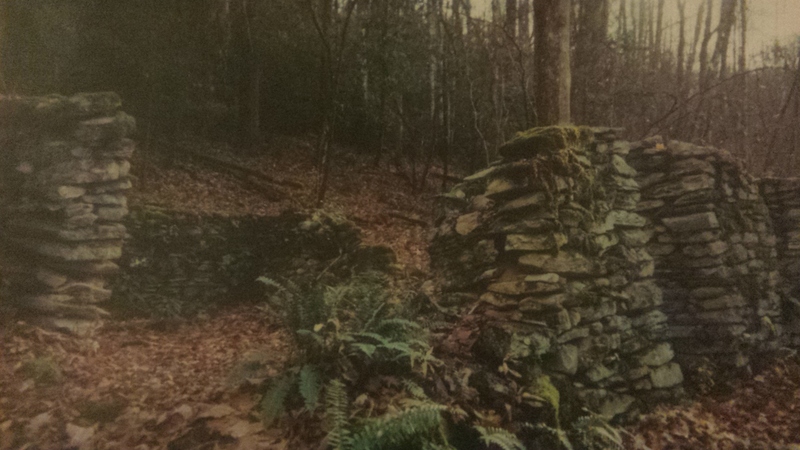 There are old fence posts and rock walls left from this settlement. 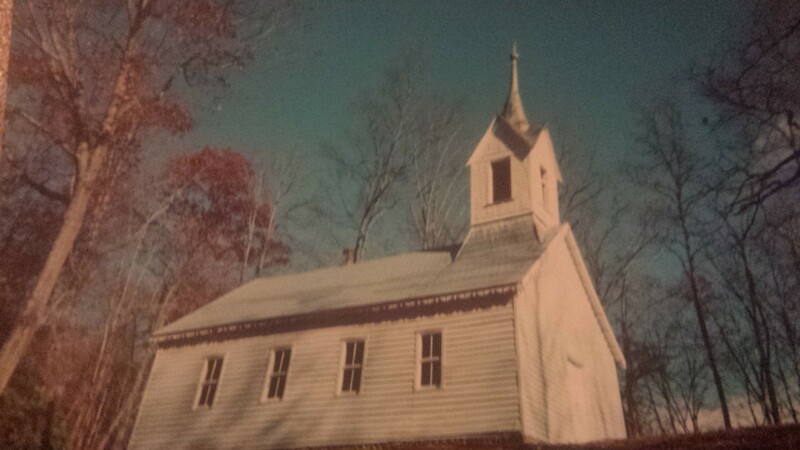 The road winds uphill from here and at mile 2 reaches the Little Chataloochee Baptist Church built in 1889, on a small hill to the left. I stop here for a while and go in. There is an old Bible on the book board and I read aloud out of it. I wanted the word to be heard in that church again even if I was the only one hearing it. I said a short prayer and took a few photos. There is a cemetery on the hillside in front of the Church. What a beautiful place. Back on the trail I reach the Dan and Harriet Cook old home place at 2.6 miles. To the right is stone ruins of an old apple house. 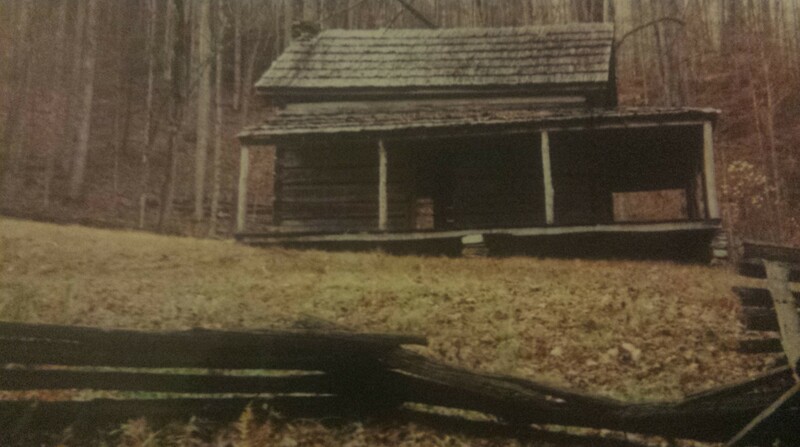 The cabin is from the 1850’s and stood here until 1975 when it was dismantled and the materials were put into storage. In 1999 the cabin was reconstructed. From here the trail begins to get steeper and steeper as it climbs to Davidson Gap at 3.2 miles. 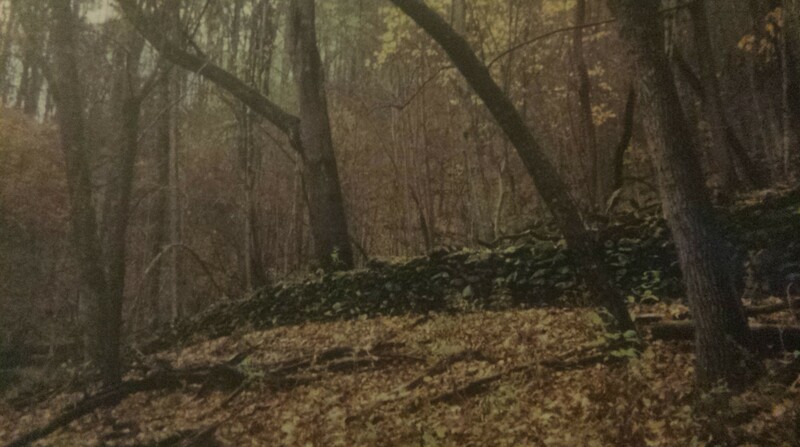 I passed more rock walls on the hillside. Passing through the gap and out of the Little Cataloochee Valley, the trail is just as steep on the other side going down. More rock walls are easily seen from the trail. At mile 3.8 the trail goes in the Davidson Branch for several yards then crosses back and forth several more times. The trail ends at a junction with Pretty Hollow Gap Trail at mile 5.2. This trail has a elevation change of 1000 feet. The trail head is at 3000 feet, the gap is at about 3700 feet and the end of the trail is at 2650 feet. I turn right on Pretty Hollow Gap trail and travel the 0.9 miles up to campsite 39. I am very tired and it is getting late. 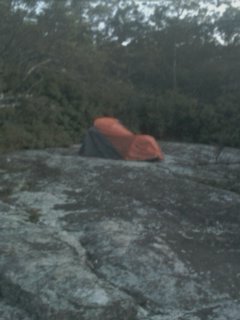 The camping area is in bottom land but I move on up the hill-side to get in more of the forest and away from the trail. I quickly set up the hammock and start gathering firewood. There are no other campers here so I check the other sites for wood. The only other people I see this day on the trail is a group of horse riders that come down the trail after sun set and I can hardly see them in the fading light. I get my fire going, it is the only thing I have to keep Big Foot, bears and all the other monsters away. You think your brave? Try sleeping alone in the middle of nowhere in a hammock tighten between two trees. Most people can’t handle it but I love it. It does get a little spooky when the coyotes start to howl. The next morning while eating breakfast one couple passes. They came from Cataloochee 2 miles down the trail. The trail follows Pretty Hollow Branch most of the way up the 4.6 miles to Mount Sterling Trail. There are to many interest on this part of the trail. It crosses the Branch several times. I get passed by a couple on horseback but they soon returned down the trail because of downed trees. It takes a lot of work to keep the trails open and 90% of it is done by volunteers. I have seen several groups while hiking over the years. The forest changes from Hemlock to hardwoods as I gain elevation. Once at Mount Sterling trail at Pretty Hollow Gap, I stop and eat lunch. It is the first time I try a MRE. They are a great invention but I have tried them on several hikes and have decided they are not for long hikes. They are to heavy and do not give me the protein and energy I need. From the gap it is only 1.9 miles to the Fire Tower. On the ridge top the forest turns to Spruce and Firs. The Tower was built in the 1930’s by the C.C.C. It sits on the 5842 feet summit. The steel frame tower is another 60 high. If you are afraid of heights don’t even think about making this climb. The view from the tower is among the best in the park. remember I said in the park. The Hang over still has it beat. The summit is teeming with people. There had to be 15 to 20 people here. I had only seen a few people in the dark ride by on houses the day before and only 4 people this day before reaching the summit. So it seamed like a lot. 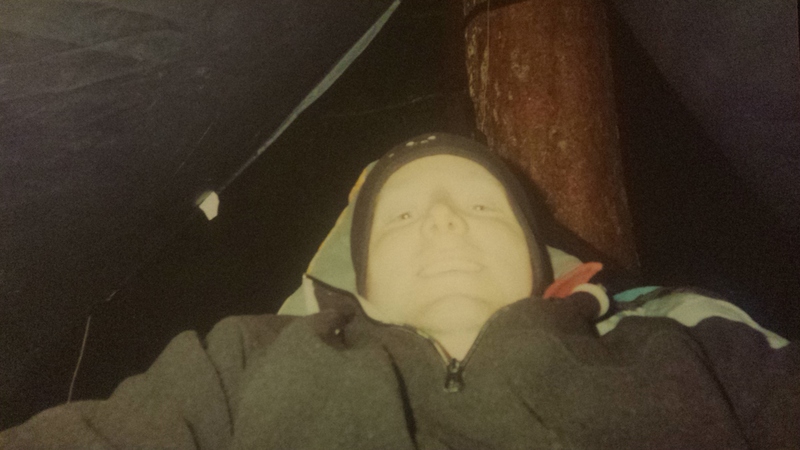 From reading my guide books I knew it would be a cold windy night, so i tried to pick a spot I thought I would be protected from the wind in the Hemlock forest away from the other campers. It was hard to find that perfect spot. I did not try to have a fire. I just relaxed in my hammock and studied my guide-book and maps. The temps dropped down to the 20’s and the wind was strong all night. I didn’t get much sleep. The next morning I climbed the tower to get one more view. From the Tower it is a short hike back down to the Mount Sterling Trail and a steep descent to the Long Bunk Trail 1.7 miles away. From here it is another 4.7 miles to the Little Cataloochee trail and 1 more mile to the truck. I made this 7.4 mile down hill hike in less than 5 hours. I passed several American Chestnut Trees and the Hannah family cemetery. But I only passed two other people. If you get off the beaten path you can have the park to yourself. 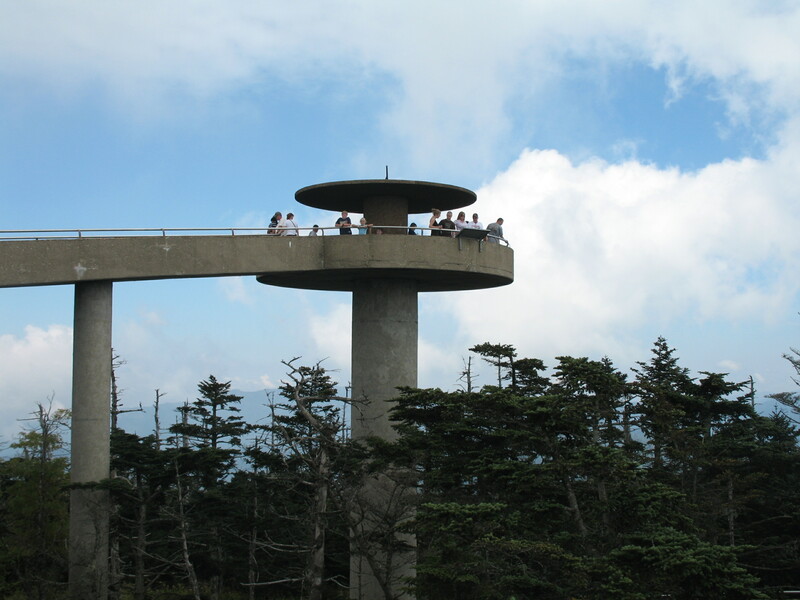 Clingmans Dome, at 6,643 feet, is the highest point in the Smokies and the third highest east of the Mississippi. The AT crosses over it and is the highest point on the trail. 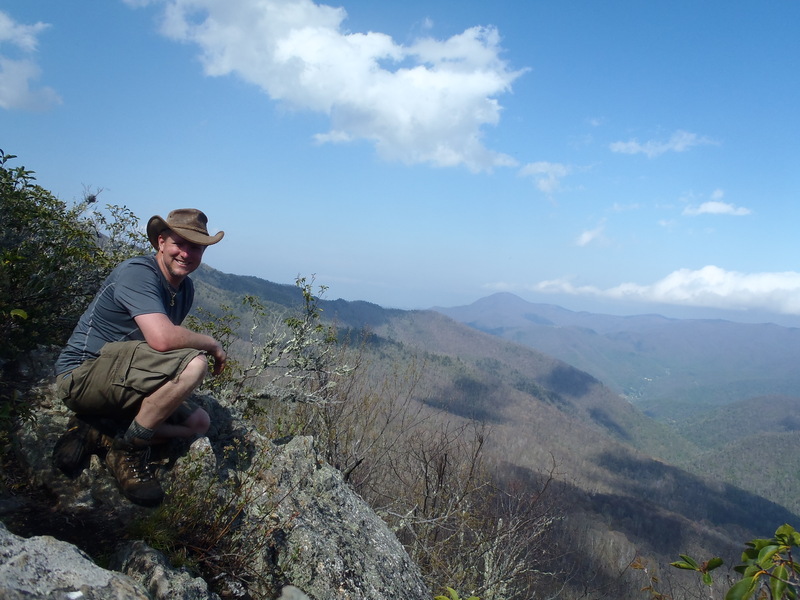 If you want to hike the AT in the Smokies and if you can it is a good idea to start here. That way most of your hike is down hill. From Newfound Gap it is seven miles to the parking lot and another 0.5 miles to the summit. 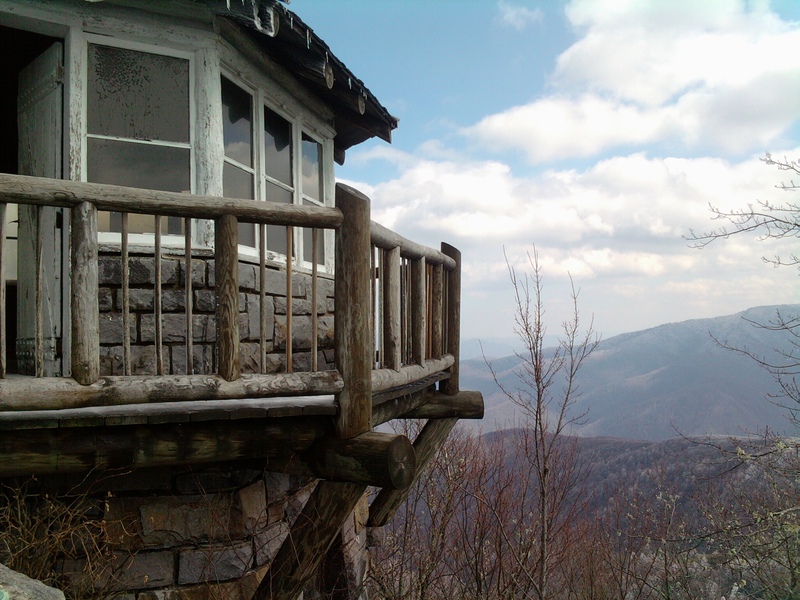 A lookout tower offers 360 degree, 100 mile view. A very remote part of the park is Balsam Mountain. From Cherokee take the Blue Ridge Parkway to Heintooga Ridge Road. If you can get a camper up the mountain there is a great camping spot just before you enter the park on top of the mountain with great views. Maybe better than any sun set views in the park. From Heintooga Overlook the road is one way to Big Cove Road back in Cherokee. At the Heintooga over look there is a picnic area built by the C.C.C. 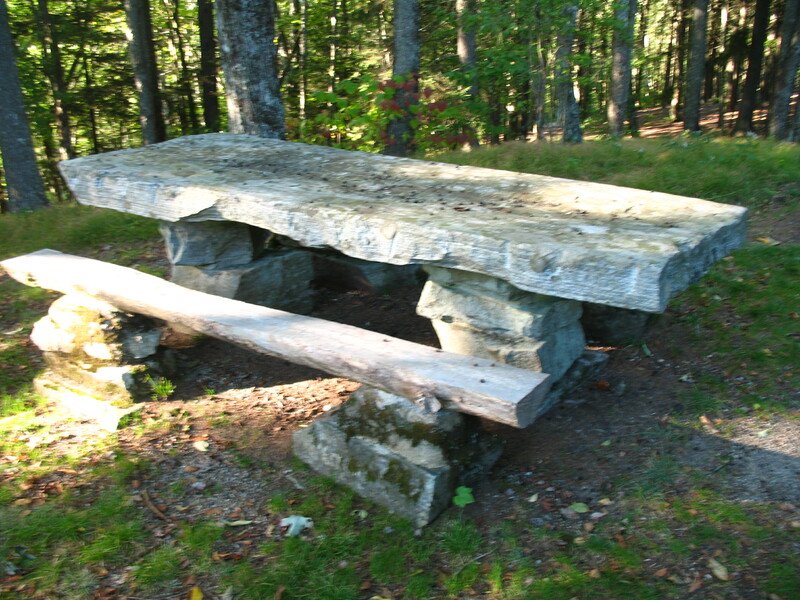 The table tops are one big stone slab. There are several trial heads off this road. Wendy, Sarah, Wyatt and I hiked a short way down the trail at the over look. Off the road at a small grassy meadow is a strange monument. Build by The Masons it is a guide post of some type. On a return trip with my brother Todd and his wife Toni we stopped here so I could show him the monument. He is a Mason and I thought he would find it interesting. 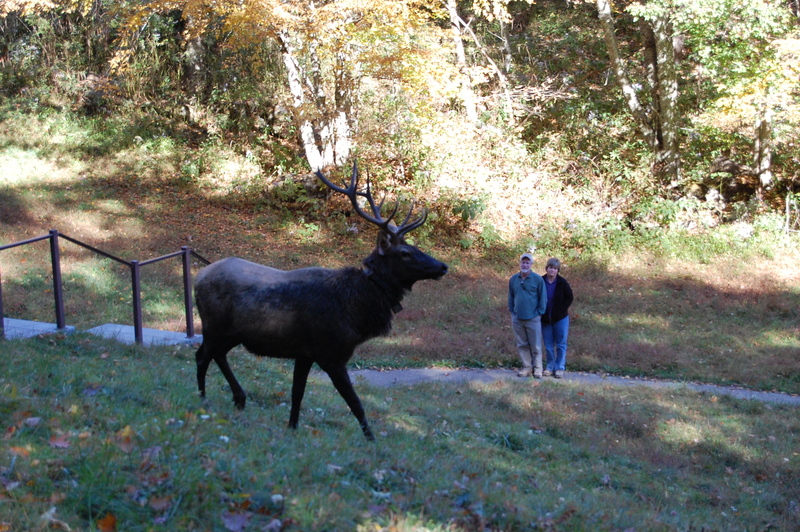 While walking to it we found a Bull Elk. I came around the up hill-side and Todd and Toni came around the down hill-side of him. They were able to get very close to him and I got several good photos with the three of them. We have had a lot of adventures over the years. More than I can remember. I am sure there will be a whole lot more. Tonight is the first game of the season for the North Paulding Wolf Pack Varsity Football team. They will be playing Kennesaw Mountain at their field. Wyatt is on the freshmen team and will not be playing tonight. His first game is September 8th. 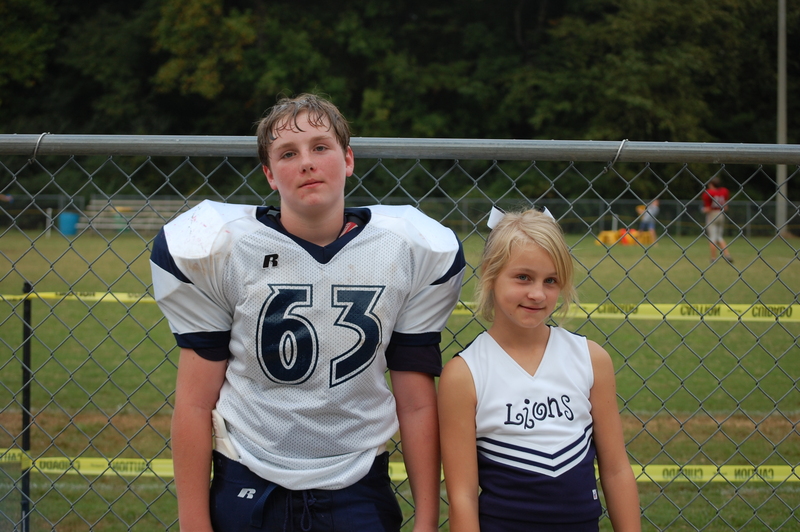 Sarah will be cheering for the Junior Wolf Pack 7th grade team at East Paulding tomorrow. Can’t wait to see some football. Once we get rolling we will be going to freshmen games on Thursdays, Varsity games on Fridays and Junior games on Saturdays. Through some cheer competitions in the mix along with practice and painting the field for me and we have a full plate. Go Pack! 8th grade won for the sweep! Lets hope varsity can do the same the Friday.